sv Hera, a research project for the NAS Adopt a Wreck scheme. Since the sailing vessel, the Hera, sank in 1914, she has undergone a lot of changes. Over the last eight years we have dived it many times, talked to people from around the area including retired divers and collected as much information about the wreck as possible. Culminating in the 100 year anniversary commemoration services at St Symphonian’s Church at Veryan, Cornwall. Our main goal was to find out why it ended up in two separate parts, lying parallel, with the bow and stern alongside each other about 12m apart. The Hera was a four masted steel barque. It was rigged with royal sails above double top and single topgallant sails. Weighing in at 1,994 tons and measuring 276x41x23 ft, it was a large vessel. Built in 1886 by J.C. Tecklenborg, yard no. 58, it was originally named the ‘Richard Wagner’. A German document written in 1982 states that it was built completely on spec, it was the first iron ship the yard had built and their first tall ship. It took three years to sell and in the meantime was used by Franz Tecklenborg’s company, the yard owner’s brother’s company. It made several trips, bringing grain back from San Francisco. It was sold to Rhederi Aktien Gesellschaft of Hamburg in 1889. On January 30th 1914, The Hera was ninety one days out of Pisagua, Chile. En route to Falmouth with a cargo of nitrate worth 30,000 British pounds, a very valuable cargo at the time. The winds were strong from the south west, Captain Lorenz was unsure of their position. He sailed slowly, looking for either the Lizard or St Anthony’s light. As dusk fell and the conditions worsened, there was still no sign of any light. Just before midnight, land was sighted, Captain Lorenz ordered the ship be put about. In the stormy conditions that night, the ship was slow to respond. She hit the Whelps, on the south side of Gull Rock, in the south westerly gale just before midnight on January 30th January 1914. Taking on water, she then drifted around Gull Rock and eventually sank in the early hours of February 1st. When it sank in 15m of water, only her masts and rigging remained above water, the crew were clinging to the wet rigging and ropes for their lives. Eight men clung to the rigging in total, but, as the tide rose three were gradually covered by the icy water. With one whistle between them, they passed it along and blew in turn, until the Falmouth lifeboat, guided by the whistle rescued the five survivors. The lifeboat ‘Bob Newton’ was set the task of recovering the survivors. The Bob Newton was towed from Falmouth by the tug ‘Perran’, to about a mile offshore (possibly Carne Beach). It then made it’s way between Nare Head and Gull Rock to speak to the coastguard on the shoreline. The survivors were discovered clinging to the jigger-mast which had broken, and which was held fast by the backstays and which protruded above the water. When rescued the men were half dead with cold, exposure and exhaustion having been clinging to the mast for between five and six hours and buffeted by tide and seas. Three others of the crew, who had clutched at the mast for safety, were forced to leave go their hold of it and perished, whilst the first mate, who was lashed to the mast, succumbed before help arrived. Only five of the twenty four crew survived, fifteen of the deceased were buried in the churchyard at St Symphonian’s Church, Veryan. The grave interred the first twelve bodies that were recovered and is thought to be the longest grave in the country, as they were buried head to toe. Three more bodies were found and buried alongside their crew mates. The captains body was returned to Germany but three bodies were never found. Over six hundred people were reported to have attended the funeral by the vicar, Canon Kempe, who was accompanied by other clergy and Chaplain J.C. Badger (Falmouth). The Hera was sold at auction to the Harris Brothers of Falmouth for £205. Much of her gear was salvaged. It was reported in ‘The Echo’ of July 1914: ‘a Trinity House ship was noticed near Gull Rock…..an explosion was heard….afterwards huge spars and logs of wood were brought ashore. It is assumed that ….the ‘Hera’ has be blown up on account of her danger to navigation more especially to the fishing and crabbing boats’. This would explain why she now lies in two major parallel sections, with the stern and bow almost alongside with the ships masts between them. In 1959 a group of divers explored the Hera, they were taken to the wreck by the fishing boat of Les Johns and William Arthur Blamey. Among items recovered were some of the ship’s portholes. In 1970, a group of divers from RAF St Mawgan sub aqua club began to investigate the wreck. Photographs were taken and the divers brought up a number of artefacts including links of chain, pulley blocks and lumps of steam coal stamped ‘Cardiff’. I obviously really enjoyed it. I can now spot the obvious errors, that, a first glimpse could easily have been made. I still hadn’t realised that the ‘A’ frame was indeed the remains of the bow. No one else on board knew either. I dived the Hera almost every month when the weather allowed but didn’t always write about it. My next written piece was on 29th July 2007. That was the first time I had found the stern section of the wreck, I could feel my fascination increasing. This was my fourth dive of the year on the Hera. My next written account was several months later on a Friday evening dive. There were dives where I took the camera and never wrote about it, and, there were times I just dived it for fun. It was around this time that I had decided to find out as much as possible about the Hera. I wanted to collate as much information about the Hera as possible, these pages are the result. Although the Hera struck the Whelps on January 30th, it didn’t sink instantly, so technically it sank on February 1st 1914. On Saturday November 30th, we took out nine divers and 1,200 lobsters, on our RHIB Stingray, to the Hera wreck. During the week, we had received a phone call from the National Lobster Hatchery, asking if we were diving at the weekend. We had already arranged to dive the Hera followed by the Stanwood wreck on the Saturday, and, we already had a few booked on the boat. After describing the sea bed substrate around the Hera, to Ben at the Hatchery, he said it sounded ideal. The sea bed around the Hera is a mixture of Maerl (dead and alive), coarse sand and shells, giving the juvenile lobsters plenty of places to bury and hide. Most of the divers were locals and some had even previously released the baby lobsters on our boat before. Two divers had come down from Portsmouth and loved the idea of helping with the release. Eight divers each took down one tray, containing roughly one hundred and fifty 25mm long lobsters. Several had cameras, one diver just took their camera to film some of the releases. We had also planned to dive the Hera on February 1st, 100 years to the day of it’s sinking. Whilst talking about it and making preparations, I was contacted by Father Doug Robbins. Father Robbins was after any photos or footage we had of the Hera, it was for a commemorative weekend over the 1st and 2nd of February. After several emails and many photos and links to videos on You-Tube had been sent, I asked if they wanted a plaque or wreath laying on the Hera on our dive. We agreed on a plaque, which we collected from Father Robbins at the church. The weather on February 1st wasn’t suitable to go to sea, so we had to delay our trip. With the winter storms of 2013/2014, it was 7 weeks before the conditions were suitable to dive the Hera. On 1 February 1914, the sailing barque ‘Hera’ foundered and sank near Nare Head. To commemorate the event, divers attached a plaque to the wreck, in memoriam to the 19 souls who lost their lives. It had originally been arranged to be placed on the wreck on 1 February of this year, the 100th Anniversary of the sinking. Mark Milburn, of Atlantic Scuba, who arranged the event with Father Doug Robins of Veryan Parish, said that the weather had been so unfavourable that they had been forced to bide their time. We will continue to update our site if we find any more information or if there is any changes to the wreck. The winter storms of 2017/2018 have caused some damage to the Hera. One of the capstans has fallen over and around 30cm of sand has been removed. There is quite a lot of fresh rust, where plates have become exposed or moved. Atlantic Scuba in Falmouth, Cornwall has become the first dive centre in England to become affiliated with The Nautical Archaeology Society (NAS). Traditionally, NAS organise skills days for their Recorder and Surveyor courses, as well as many other archaeology related courses. These are usually at a set location and on a set date and are organised up to a year in advance. Atlantic Scuba will be able to hold courses ‘on demand’ as they do for the range of diving courses they already offer. The Recorder and Surveyor courses can be taught as underwater courses for the qualified diver, or as intertidal courses for non-divers. Atlantic Scuba intend to offer taster sessions for anyone who is interested in Nautical Archaeology. They will also be offering fieldwork days for those who have already completed the required NAS courses. Find out more at www.atlanticscuba.co.uk. Find out more about the nautical archaeology Society at www.nauticalarchaeologysociety.org. At Atlantic Scuba we can teach some of the Nautical Archaeology Societies Courses, the ‘Skills Days’. The Nautical Archaeology Society (NAS) produce a range of courses, mainly around the subject of underwater archaeology. They start with three online courses, the NAS Introduction to Maritime Archaeology Course, the NAS Intertidal & Terrestrial Archaeology course and the NAS Underwater Archaeology Course. The online courses are not compulsory before starting the practical courses, they will however, give you a good basis for nautical archaeology. 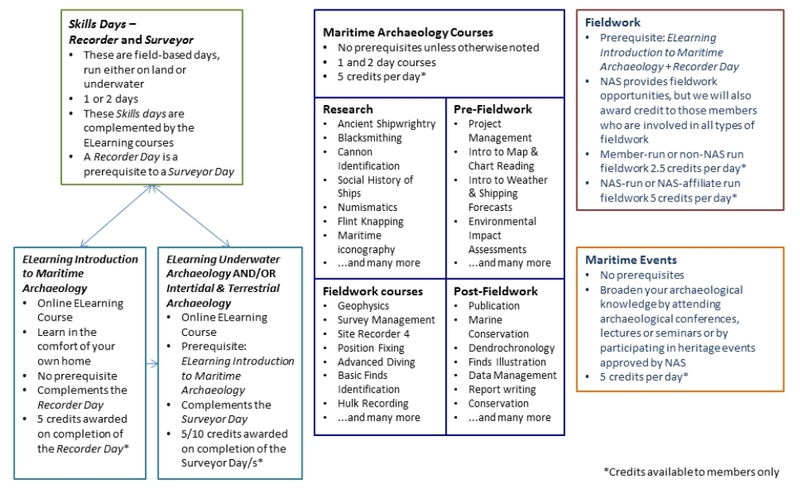 If you would like to enrol in both the ‘Introduction to Maritime Archaeology’ and ‘Intertidal & Terrestrial Archaeology’ courses OR the ‘Introduction to Maritime Archaeology’ and ‘Underwater Archaeology’ courses, you can select the ‘Combined’ course option that is relevant to you. Step 1 – Create an account on the NAS ELearning Site. Follow the link above which will take you directly to the ‘Create new account’ form. You will need to fill in the form with your details. Please note that each individual who wishes to create an account will need a different email address. Once you have completed the form, click ‘create my new account’. An email will be sent to your email address, click on the link in the email and this will confirm your account and you will be logged in to the NAS ELearning Site. Once you have logged in to the site, you will see the courses which are available to you. Select the course you wish to enrol in and click on the course title. You will then be taken to the PayPal page in order to pay for your chosen course and complete your enrolment. You can pay for the course using a credit/debit card or using your PayPal account. If you decide the bypass the eLearning courses and go straight to the ‘Skills Days’, this is where Atlantic Scuba can help. Once the ‘Skills Days’ have been completed, you may then continue along your path with NAS Maritime Archaeological Courses. Anyone can take these courses and members can gain credits toward a certification if they wish. There are no prerequisites unless noted (mainly in the Fieldwork category). The courses fall into four main categories: Research, Pre-Fieldwork, Fieldwork (practical and classroom-based) and Post-Fieldwork. For more information on how to get involved with fieldwork, see the NAS Timetable and visit the NAS website. 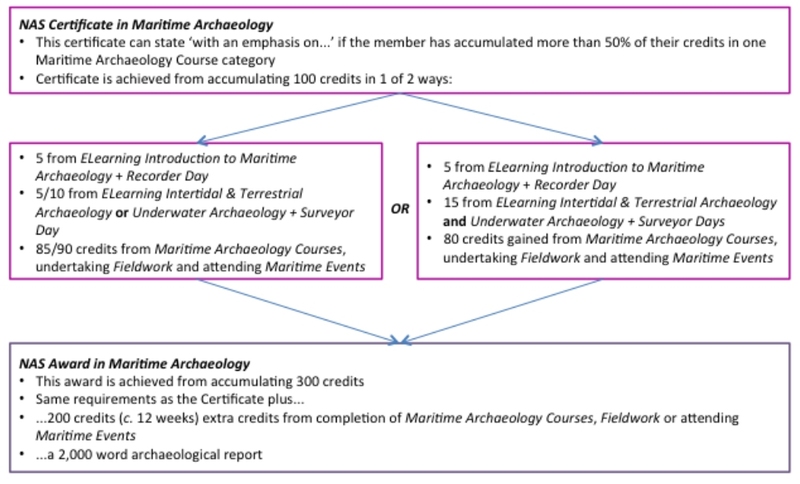 A member can achieve an Award in Maritime Archaeology once they have achieved 300 credits and completed an archaeological report, presented at the NAS Annual Conference. The following aims and objectives explain what will be covered in both an Intertidal and Underwater Recorder Day. Please refer to the timetable for a breakdown of how the day will be spent. By covering the learning objectives for the day participants should be able to understand what the NAS is, how they can get involved further and where to go for help. They will also understand how to be safe on site and how archaeological sites are linked. They will also be able to show an awareness that maritime sites are not only underwater and will be able to demonstrate the practical skills required to record a site. 09.15 What are we working on? The following aims and objectives explain what will be covered in both an Intertidal and Underwater Surveyor Days. Please refer to the timetable below for a breakdown of how the day(s) will be spent. By covering the learning objectives for the day participants should be able to understand what the NAS is, how they can get involved further and where to go for help.They will also understand how to be safe on site and be able to show an awareness of project planning. All participants will also be able to demonstrate the practical skills required to survey a site. Please note Timetable is provisional and may be subject to change.